Many centuries ago Norsemen (also known as Vikings) used to celebrate Midwinter or “Yule” festivals: they would indulge in nights of eating and drinking and watching the fire lick away at a log in the hearth. They associated the Yule log with good health, abundance, productivity… and fertility: many historians view the log as a phallic symbol. The tradition of burning a single log of freshly cut wood on Christmas Eve has survived throughout history: it is a custom that is still upheld in many European countries. There are of course a few differences between the various traditions, but the gist of the ceremony is quite similar for all of them. On the day before Christmas, the “master of the house” (the father) goes out (sometimes with his entire family) to cut a piece of wood, and then brings it into the house. It is placed into the hearth, though frequently this is preceded by some kind of ritual: carrying the log around the kitchen three times, for example, to request plenty of food for the next year. 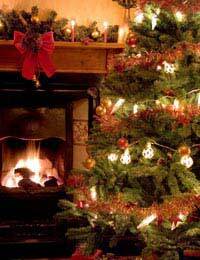 Once the log is in the hearth, it is sprinkled with plenty of offerings: salt, oil and mulled wine, to name but a few. Depending on the culture, prayers are said before lighting the Yule log and lighting the log is not just a matter of holding a match under it either - there is a traditional way. The log should only be lit with little pieces of last year’s Yule log, and preferably by the youngest daughter. If there are no daughters in the family, it is the mother who sets the chunk of wood on fire. The intention was (and to those who still honour the tradition is) to keep the Yule log burning the whole night long and preferably the whole of Christmas Day too, so the size of the log and the kind of wood used were (and are) very important. The Yule log custom got a bit lost when people started replacing their hearths by stoves and – later still – central heating. The log was still brought into the house, but it had become a lot smaller and was no longer burned, but decorated and placed onto the table instead. Together with the disappearance of the burning tradition came the rise of the Yule log in the form of a pastry that is eaten on Christmas Eve. These log-shaped rolls of fluffy cake and rich cream are often called by their French name (“bûches”) and have become extremely popular – they are a big hit not just during the holiday season, but all winter long.